Meatballs are one of those dishes that can be made and eaten at home with salad or for those wanting to bulk it up more a side of homemade chips, yum! My recipe uses lean mince turkey. For a change I bought ready minced turkey as I wasn’t feeling too great and wanted to speed up the process of making the meal. Turkey is great for you as it has a low GI (glycaemic index) which means it raises blood sugar levels slowly so good for those with Type 2 diabetes. Turkey of course is a great source of protein and has less fat than other meats. It contains various nutrients including zinc, iron, potassium, phosphorus, Vitamin B6 and niacin. Combining this with ingredients such as brown seeded bread, coriander and onion helps to increase the fibre and nutrient content of the dish. Make approximately 35 balls depending on sizing. Place one slice of bread which has been pulled apart into the nutribullet and blitz briefly we don’t want the breadcrumbs too fine. Repeat with the rest. Grate the potato with the skin on. Chop the onion and coriander. Place the turkey mince into the mixing bowl and using the dough hook attachment give it a quick mix. Throw in all the other ingredients and mix well. With a tablespoon scoop out some of the mixture with a tablespoon and squish (a nice technical foodie word) the mixture into balls approximately 3cm in diameter. I prepare enough to cover my chopping board and then heat up the oil until I get a gently bubbling when a ball is added (see photo below). I normally test the first ball by cooking it and then tasting it to make sure it has been seasoned enough. 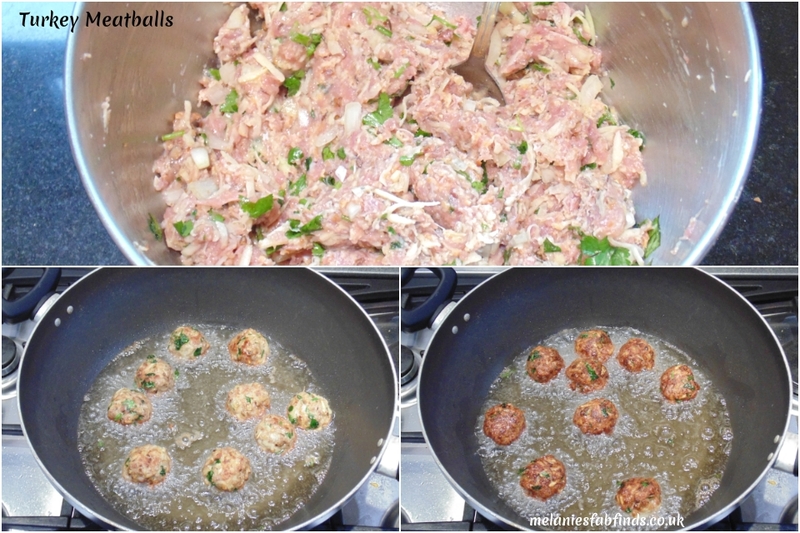 Cook the balls in batches so that they are easy to turn half way through. If you cook to many at the same time they can get broken easily. Allow the balls to cook for a few minutes on each side. Remove them from the oil and place on a plate covered with kitchen towel. Leave them to drain off whilst you do the next batch. I normally allow the excess oil to drain off, add the cooked ball to a plate / bowl and change the paper to help remove as much oil as possible from them. I am always careful to use just a little salt when making these as the children eat them too. Should you require a little more then just sprinkle it over after. Once all the balls have been shaped, cooked and had any excess oil removed serve whilst still hot. Is it a ball or a balloon? I used to make turkey meatballs all the time when I ate meat. They are really good with sundried tomatoes in them. Aaahhhh thanks so much Lynne. They are so tasty and easy to make too which is great. Great recipe and this would be good for an appetiser at a party. They sure would as they are easy to eat. i remember making turkey nuggets and when they turned out to be too salty because of the premade meat. I made them in youghurt/ramen breading. We’re not usually big fans of turkey meatballs, opting for beef, but these look delicious. The pork ones are really nice. I don’t normally make them with beef but hope to give that a go. Perfect that’s a sign! Give them a go. They are yummy! Thanks I’m sure you will enjoy these. They are tasty and not expensive to make. Absolutely LOVE turkey meatballs , I find them much nicer than beef to be honest and soooo much leaner !! They are much leaner and just as tasty. It is much leaner so makes a healthier meal. 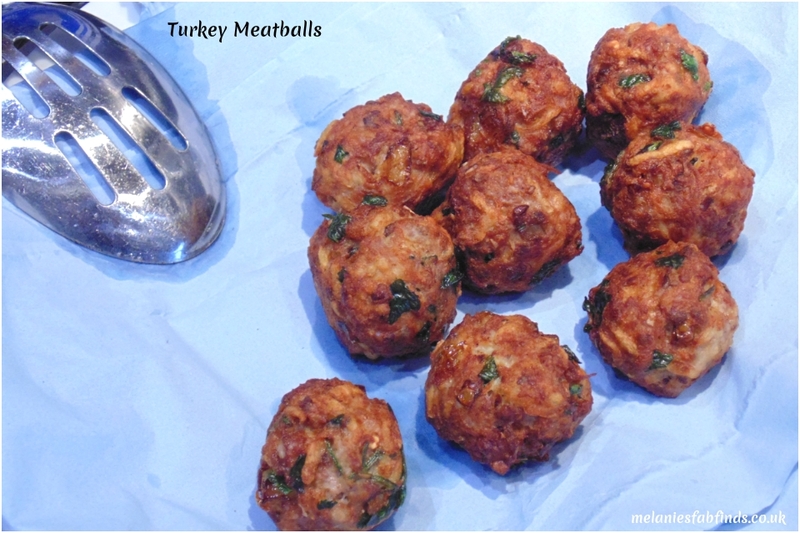 I love the idea of having Turkey meatballs as I’m not keen on traditional pork. They are great and you can always adapt them to your taste. They are also great with pork mince! They are good and great with a salad and chips. Enjoy John, they are yummy! This is a lovely recipe. We love meatballs in our house, we make Swedish ones with cranberries in. They sound yummy I will need to try that. These look great! Homemade meatballs are great. We like beef omes with a little bit of cheese in the middle! Those sounds great I made some with olives in the middle which were good too. These look so tasty! I’ve been cutting back on red meat, so this is right up my alley. Very lovely sounding, I think I would attempt to bake them though, as we don’t fry. I wonder if they would come out okay? They don’t seem to come out as well baked unfortunately. I make them with pork too and other ingredients they are very flexible a food to make. I really enjoy meatballs but i’ve never tried turkey. Sound good and relatively healthy, must have a go at them. They are not too bad healthywise even though they are fried. Great as I have some turkey in my freezer and have not known what to do with it. I will use my Nutribullet! These do taste great and you can always add to change ingredients.